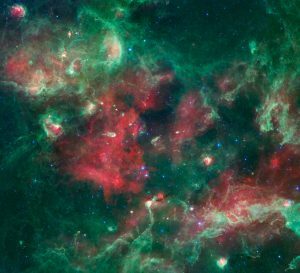 Can we see neutrinos from the star-forming region Cygnus? What is the Cygnus region? The Cygnus X region is a particularly interesting region of the sky. Located in the Galactic plane and named because it is located in the Cygnus constellation, it is the largest star-forming region in the entire Milky Way. It contains massive clouds of molecular gas, which are important for star formation, and many young stars. Gamma rays (the most energetic form of electromagnetic radiation) have also been detected in the region by a number of other experiments, including Fermi-LAT and Milagro. In gamma rays, point sources and regions of extended emission make the area very confusing. One of the most interesting extended regions is known as the “Cygnus Cocoon“. In some scenarios, the interactions that produce gamma rays are also expected to produce neutrinos, tiny little particles that are useful as astrophysical messengers. Detecting neutrinos from the Cygnus X region is interesting because it would give evidence that a PeVatron lies in the Galactic disk. A PeVatron is a source that accelerates protons up to 1 PeV and are one of the key components to determining exactly how cosmic-ray acceleration* works, one of the great unsolved mysteries in particle astrophysics. To give an idea of the energy scale, this is orders of magnitude larger than what the Large Hadron Collider can accelerate to on Earth! 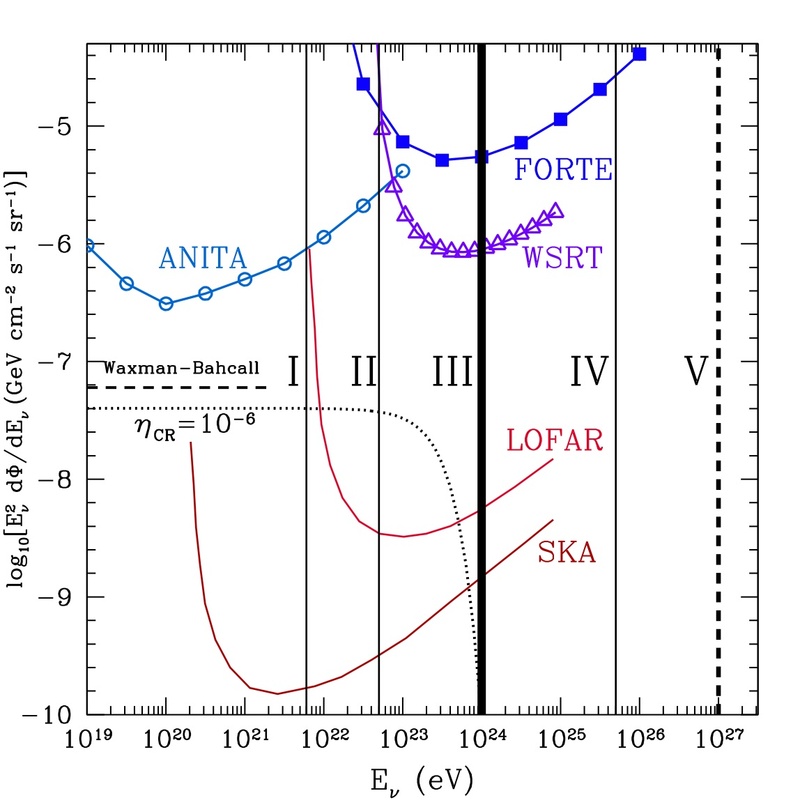 The HESS experiment made waves earlier this year when they announced that they had seen evidence of a PeVatron at the Galactic center (Astrobites writeup here), but to date, this is still the only PeVatron discovered. *You may wonder why we focus on gamma rays and neutrinos instead of cosmic rays themselves. For one, they are a lot easier to interpret, since they are both neutral and don’t curve in magnetic fields on their journey to Earth. The authors set out to determine if the neutrino spectra from the Cygnus region has a large enough flux to be detected by IceCube, a neutrino experiment located in Antarctica. This was a multi-step process: first, they came up with a model for the interstellar medium in the region by deriving gas column densities and incorporating dust maps into a calculation of the interstellar radiation field. They then modeled the gamma ray emission in the region by comparing with observations to make sure there was rough agreement and then calculated the corresponding neutrino flux. Unfortunately, it turns out that the neutrino flux associated with diffuse emission in the Cygnus X region is much below IceCube’s sensitivity, eliminating the possiblity that neutrinos will be detected from the region. However, looking at the Cocoon region gives a different picture. The calculated neutrino spectra at 1 PeV is just above IceCube’s discovery potential for point sources. Since the Cocoon is extended, the discovery threshold is slightly lower in reality and there is an even a greater chance of IceCube seeing something. The authors also looked at a small region of the Cygnus Cocoon that is coincident with a molecular cloud. They chose this region because it is likely to be associated with hadronic emission (which would create neutrinos) from a single cosmic-ray accelerator such as a supernova remnant or pulsar wind nebula. The neutrino flux from this molecular cloud is regrettably too low to be detected by IceCube. 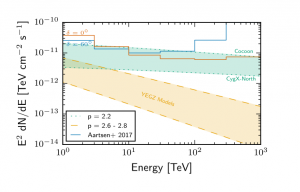 With our current understanding of the area, there is a chance that the overall Cocoon region could be detected in neutrinos (see the figure above). If this happens, it will increase our knowledge of how cosmic-ray accelerators are distributed in the sky, and provide the first evidence of a PeVatron in the Galactic disk.